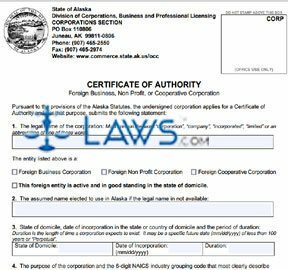 This form is used when a foreign business, non-profit, or Cooperative Corporation wants to establish a corporation in the state of Alaska. If you need help with this form you should contact an attorney. In part 1, provide the requested name of the corporation. Make sure you understand the rules for forming a name for the corporation. In part 2, provide an assumed name for the corporation. If the company elects to use the name in the state of domicile (where the headquarters are located) but the name is already used in Alaska, the assumed name will be used. In part 3, provide the state of domicile, date of incorporation in the state of domicile, and how long the corporation expects to last. Write “Perpetual” if there is no time limit. Provide the purpose of the corporation in part 4. Provide the NAICS Code for the type of business. Provide the address for the corporation in the state or country of domicile. Provide the name and address of the Registered Agent in part 6. The Registered Agent needs to have residency in the state of Alaska. If there is an alien affiliate, provide their information in part 7. If there is no alien affiliate, write “None” in this section. In parts 8 and 9, provide the types, series, and par value of the common or preferred authorized shares and issued shares. Provide the name and addresses for the officers and directors of the corporation in part 10. Provide the names and addresses of all people or entities owning 5% or more of the issued shares in part 11.